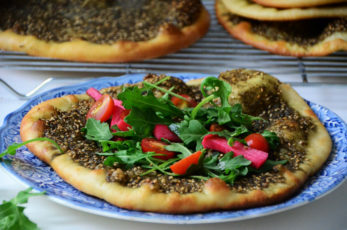 Reem Assil, Syrian-Palestinian-American, activist and cook, joins us in studio to tell us about her new project: Reem’s – “Traditional Arab street food made with California Love!” Reem’s goes beyond the transaction of food to feature the warm hospitality of Arab culture. She offers a culinary discovery of the flavors, aromas, and techniques of local bakeries in Damascus, Beirut, and Jerusalem. Whether you’ve experienced Arab culture before or this is your first time, Reem’s baking up some treats! You can visit one of her pop-ups, food festivals or farmers market stands or attend one of her classes! Update (9.12.16): Congratulations to Reem on raising $50,000 to open her own, “Arab Street Corner Bakery”!